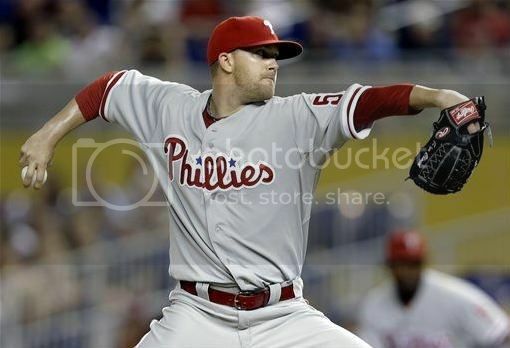 Behind a second straight admirable start by Tyler Cloyd, the Phillies were able to snap a three-game losing streak against the Marlins, beating them 7-3. After scoring three runs in three straight against Miami, the Phillies offense finally found its stride. The team notched 15 total hits, including four doubles and a home run. The outburst was a welcome sign for a team that had really been struggling. It’s a step forward. Now the challenge becomes doing it consistently and preventing the two steps back. – Juan Pierre has always been known for causing havoc on the base path, finding inventive ways to get on. Tonight, it was Tyler Cloyd injecting a little chaos of his own that allowed Pierre to reach base. Leading off the game, Pierre bunted a ball hard down the first base line. Ryan Howard fielded it cleanly and should have been able to tag Pierre with ease. Except Cloyd, who also broke on the ball, was still standing on the base line, directly in Howard’s path to Pierre. Using Cloyd as a human shield, Pierre averted the tag and slid safely into first. The play looked like a potential tone setter for Cloyd, an indication of snake bite. That proved to be untrue, as Cloyd would instead shake off the mishap and go on to pitch another good game. By the time Cloyd walked off the mound to close out the seventh inning, the unrecorded error was a distant memory. – Much like his last outing, Cloyd wasn’t particularly dominant. The Marlins managed eight hits, but only two for extra bases. It was ex-Phillies who did all of the damage. Pierre had an RBI and Placido Polanco scored two runs–the only ones Cloyd allowed. Hovering in the mid-80s, he doesn’t blow it by anyone. But right now, he’s missing bats. He struck out five and walked two. Cloyd also got two doubleplays to get out of tough jams, including one to erase his first inning gaffe. Thus far, Cloyd has turned in two very valuable starts. – For 52 at bats, Delmon Young was on sabbatical. Scuffling along (as many of us thought he would), not doing much of anything on offense. But tonight, he came to life, hammering a pitch over the left center fence for a solo home run to lead off the fourth inning. The homer gave the Phils a 1-0 lead, and was the first for Young since his first at bat of the season. He would not stop there, doubling in the sixth, which moved Ryan Howard to third. Howard would go on to score on a Domonic Brown groundout. While many have suggested Young should be benched, Ruben Amaro and Charlie Manuel have been adamant in their belief that Young will get it going. Before tonight, he had given no indication of doing that. But maybe this will start him in the right direction? I’m not exactly banking on it after one good night, but this team sure could use it. – With just two runs heading into the 7th inning, the Phillies looked destined for another low-scoring effort. But then something funny happened. With runners on first and second and nobody out, Michael Young squibbled a ball towards shortstop. Adeiny Hechavarria fielded it and hesitated, costing the Marlins even a single out. With the bases loaded and the infield in, Howard lined a ball through the right side to plate two runs and make it 4-1. The Phils notched two more run on a D. Young groundout and a Brown double. The double was Brown’s second extra base hit of the series. It marked the first time the Phillies scored seven runs since May 2. – Ben Revere stood out tonight, going 3-for-5 with a double and two runs scored. Since the calendar flipped to May, Revere is hitting .390 with three doubles and an OPS over .800. Howard also had a great night coming off an injury, adding three hits of his own and driving in three. – The Phils have now scored ten runs in two Cloyd starts. Somewhere, Cole Hamels is gritting his teeth. – Cliff Lee (4-2, 2.83) starts tomorrow in the series finale. Kevin Slowey (1-4, 3.44) will be on the mound for the Marlins.